pretty, and tranquil – but joyous too. I heart hubba lights are reflected in the water – I know there's a spiritual analogy in there somewhere. It's a beautiful shot. And one more thing Elizabeth, thank you for being there last week, you made a difference – it's been a little bit horrific, but chin up, moving forward. And I decided to go from 10 posts a week on the two blogs – down to eight – which will leave more time to read blogs that I heart – like you. because I never get to read you enough. Anyway, Merry Christmas, and God bless, and thank you again. I can't read that verse w/o "playing" it from The Messiah in my head! It is my second favorite selection in it--next to The Hallelujah Chorus! How beautiful this is, and love your music. Praise God!!! Lovely Christmas lights and great scripture. 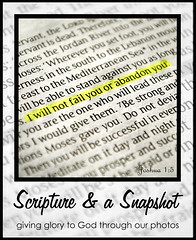 Beautiful...love the photo and the verse you chose to go with it! Wow. So beautiful! I have commented on several other blogs about our living in Florida and here I am going to do it again. When we lived on the lake, we all decorated the back of our homes that faced the water and would travel home to home by boat and view the lights. This brought so many wonderful memories back while I was looking at this pic. Thank you for sharing.